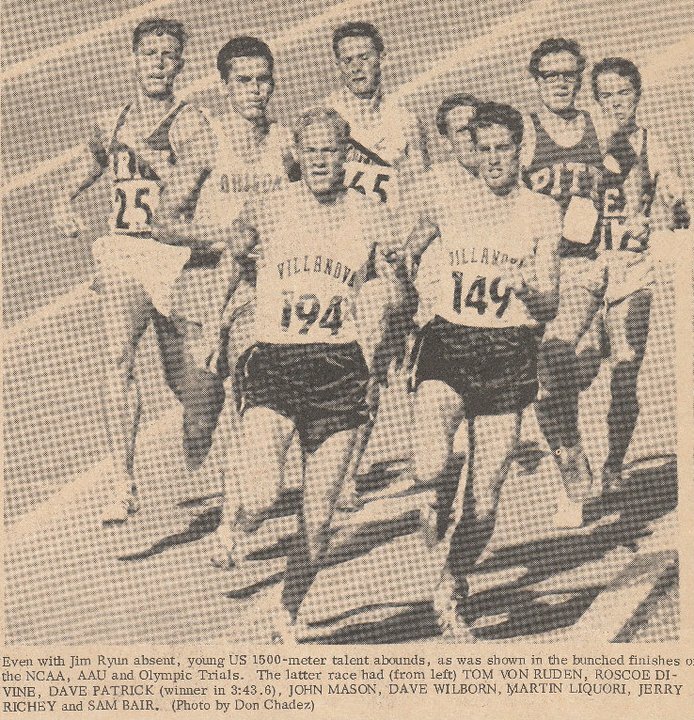 The story of Dave Patrick and the 1968 Olympic Trials is well known within Villanova running circles. 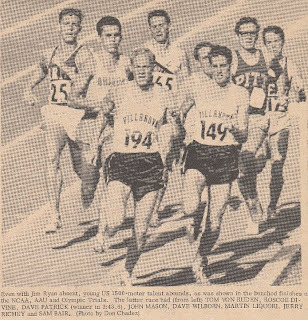 It is told as a story of injustice and unfairness, resulting in Patrick, a senior at Villanova and by all accounts the #2 miler in the United States behind Jim Ryun, being left off the 1968 Olympic team. That an injustice was done seems to have been confirmed when in 2008 the 1968 Olympic track coach Peyton Jordan surprised Patrick by announcing that he (Jordan) and the fellow members of the US Olympic Committee had voted to admit their mistake and retroactively -- 40 years later -- name Dave Patrick as an official member of the 1968 team. How Patrick was mistreated, though, has always been a bit murky, unexplained, and complicated. This post seeks to provide some details. The US Olympic Committee in 1968 decided to alter its normal method of selecting the US track and field team. The 1968 Olympics were to be held at altitude in Mexico City, and the Committee thought that it would be wise to simulate those conditions and integrate them into the Olympic team selection process. It was decided, then, to hold a two-phase Olympic Trials: (1) at the Los Angeles Coliseum at the end of June 1968, and (2) at altitude at South Lake Tahoe, California in September 1968. The vague notion at the time was that the winners at the Olympic Trails in Los Angeles would have to show fitness at altitude at Lake Tahoe in order to be assured a spot on the Olympic team. What "fitness" meant, unfortunately, was not clear when the two-pronged process started. Ultimately, to Patrick's detriment and by some rather odd machinations, the Los Angeles "trials" were thrown out and the Lake Tahoe "trials" became definitive. But that's giving away the ending. "But then, for reasons still not clear, the officials embarked upon an experiment in democracy. Just before the Tahoe trials they let the athletes themselves, in a series of group discussions, decide upon the selection system. Prior assurance to the Los Angeles winners was dissolved by a vote of all the contenders -- among whom the Los Angeles winners were a negligible minority. The majority decided that the top three finishers in the Tahoe events would make the team, and that would be that. So the Los Angeles trials, which drew 25,654 spectators who thought they were seeing the trials, were actually a preliminary meet, a big trial heat. As it turned out, Patrick was the only one of the earlier winners who definitely proved himself at high altitude (he ran the fastest 1500 meters at Tahoe in a preliminary heat) and yet was eliminated (in the final heat he ran fourth).... The entire selection process was misleading. The system should have been established early and adhered to. Then no one would have had grounds to complain that the officials had in effect reneged on an earlier promise." By all accounts, it was the track and field assistant coach Bill Bowerman, the head man at Oregon, who had raised the option of making the Tahoe trails be the determinative meet, not the trials in Los Angeles. So off to Lake Tahoe went the runners, this time including Jim Ryun. Patrick and Ryun had raced twice previously. 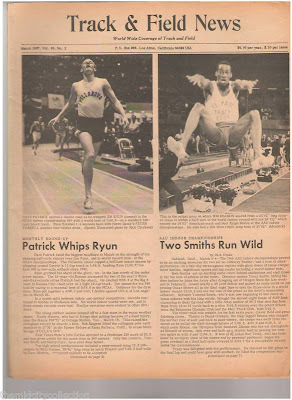 Patrick (1:48.9) had beaten Ryun (1:50.7) indoors at the March 1967 NCAA indoor championships in Detroit over 880 yards, setting a new indoor world record at that distance (see photo left). Ryun had defeated Patrick over a mile at Madison Square Garden in February 1968. Ryun came from well off the pace to win the race. He was last after 3 laps, in 3:12.4, but stormed past the other seven runners to beat Liquori by a half second. Three seconds back was Patrick, in the dreaded fourth place, and off the Olympic team. He had won the Los Angeles trials and had proven himself at altitude (his semi-final 3:48.8 was the fastest time of the Tahoe meet), but was out. 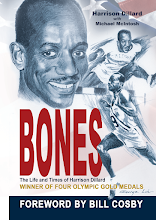 Crestfallen by the developments, his track and field career was essentially over. Years later he commented that "I can certainly forgive what happened, because I have to do that. But I will never forget what happened. ... That really pretty much ended my competitive running. I had always felt that I had earned the right to be an Olympian, and on paper I wasn't." His wife Michele admitted that "he has carried this burden for 40 years of knowing he qualified." So, when Peyton Jordan 40 years later announced at a 40 year reunion of Villanova's great 1968 team that now, officially, Dave Patrick was an Olympian, perhaps some justice was done. In the end, though, Patrick got it right: "I can certainly forgive what happened, because I have to do that. But I will never forget what happened." 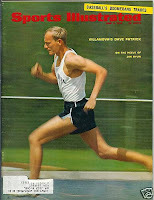 Dave Patrick was a phenomenal runner. And in view of current thinking regarding Olympic Trials fitness (going from heats to finals, with no semi, and definitely only one trial), it is clear that Dave was cheated. So sorry that you had to endure this memory, Dave. You deserved better. I grew up in the Philly area and graduated from college at exactly the time this incident took place. It was a crime and a travesty then, is still now, and always will be. Dave Patrick was a true champion, and knowledgeable track fans know he deserved to be on that team. Wish I had seen this earlier. It should be noted that Ryun's loss to Patrick in the NCAA indoor 880 was Ryun's third race of the night. Ryun had run an 880 heat (as did Patrick) but then Ryun ran a heat in the mile and then was back on the track a short while later to run the 880 final. Patrick might have been able to beat Ryun anyway, but based on Ryun running a time earlier that season on a crummy 12 laps to the mile track that was a just a couple of ticks off Patrick's time at the NCAA makes one think that Patrick was lucky that Ryun's head coach loved overworking his runners. However, Spiro is correct in that the 880 final was Ryan's third race of that day, but even that should not take away from Patrick's performance, which really was phenomenal for that era. I also saw Patrick win the NCAA 1500 in Berkeley later that year. He was a great runner and I hated to see him not on the Olympic team. I went to VU with Dave. He was a great runner and a great guy. He was a true Olympian and would have won a medal. He knows that and they can never fix that. I'm so glad to have found your post. I've been looking for information on the same type of incident that happened in the marathon. The Atlantic City Marathon Olympic trials seem to been thrown out from history. Only the Colorado trials are ever listed. It is unfair and callus to ignore all of the marathon runners that trained for the trials in Atlantic City. I hope more articles like this will arise.